Aren’t holiday lights the best? The way they can transform your home into a festive winter wonderland—nothing beats it when you’re looking for seasonal cheer. Still, it can be quite a challenge to hang them; plus, they use a lot of energy, and they’re expensive to keep lit. Here are some tips for outdoor holiday lights that are both energy-efficient and less expensive to use. The best part? Your home can still be the brightest and best decorated on the block. It’s easy to buy too many lights—or not enough. Before you buy any lights, or put up lights you already have, figure out how and where you want them to appear. Are they simply going to outline the shape of your house or your porch or roof? You can easily measure those lengths and buy accordingly. Are you wrapping them in and around trees and bushes? You’ll need more lights for this method, because they’ll need to be more densely decorated. If needed, take a photo of your house with you to the hardware store and look at your options there, with the pictures in front of you. One trick: buy a few more lights than you think you may need, but keep the receipt and don’t take them out of the box unless you’re going to install them. It’s more time-efficient to return extra lights than to have to run back and forth to the store to get more. Besides, the stores often run out of lights as the holiday season draws to a close, so it’s always better to be prepared. To figure out how many lights you need to wrap around a pole or a tree trunk, first wrap some rope or a paper tape measure around the structure. Then use that measurement to figure out the quantity of lights you need. Depending on how many lights you use, you could see your electricity bill soar from all the extra power you’ll use during the holidays. Save yourself some money by using LEDs. They use only about 10 percent of the power that incandescent bulbs do, and they’re the most efficient light bulbs on the market. LEDs come in a variety of colors, as well as bright white and warm white. The bright white give off a bit of an icy blue glow, so you might prefer warm white. An added bonus of LEDs is that they’re much more durable than twinkly holiday mini lights. That’s because LEDs are usually made of plastic, while mini lights are made from glass. Plus, if one bulb happens to break, the entire string of lights won’t go out the way they often do with mini lights. Most outdoor holiday lights should bear a tag marked Underwriters Lab (UL), which means these lights meet national industry standards for use and safety outdoors. And while it’s fine to use these outdoor lights inside, make sure never to use indoor lights outdoors to avoid a safety risk. Hardware and big box stores often contain a wide assortment of LED holiday lights, or they’ll be willing to order them for you. Otherwise, search “holiday LED lights” online to purchase them online. Look for coupons or buy two/get one free deals. Remember to order early to leave enough time for delivery and installation. Strings of lights can plug into each other so that you need fewer extension cords to connect them to electricity. 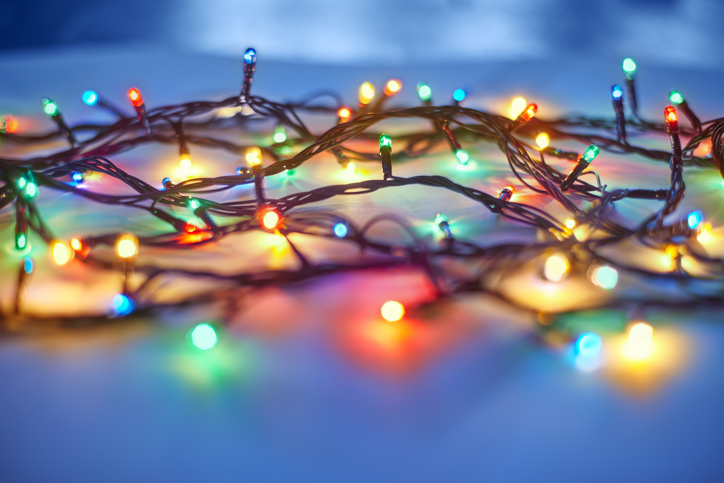 Don’t connect more than three strings together, and make sure to use the same lengths of lights when plugging them in together. Use a staple gun to secure lights vertically, stapling on either side of the wires connecting the lights rather than through the wires. You can also use push pins to secure the lights to wood on a porch rail or down a banister. If attaching lights to a roof or awning, get some help. Don’t climb a ladder by yourself, especially when you’re holding a big strand of lights and maybe a hammer and nails or a staple gun. Use lighting clips to clip lights to a roof or gutter. Don’t climb a ladder if you’re afraid of heights! 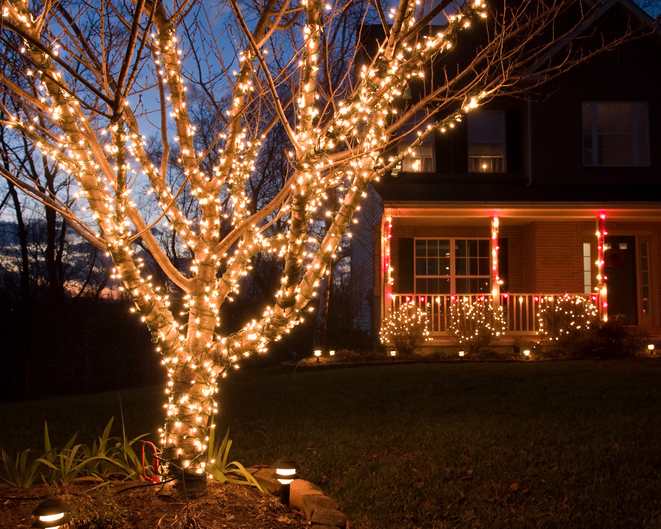 Also, make sure to string your lights after dark so you can see if you’re happy with the effect as you go along. Connect your extension cords to a timer that will automatically turn the lights on and off for you. You’ll save energy by making it easy to limit the number of hours your lights are on. Choose a timer that is designed to tolerate outdoor elements like wind, rain, and snow. Put up your lights when the weather is clear and perhaps somewhat warm. Even if that means you put them up a little early, it’s better than waiting until your holiday date is closer but also colder. After the holidays, wait until the weather warms up before rushing to take the lights down. Just turn off the timer and don’t plug in the lights when the season is over. Stash your lights in the attic, garage, shed or basement so they’re easy to find next year. You can create loops of lights and hang them over large hooks, or store them gently in well-marked boxes that may be lightly padded to avoid breaking. Don’t hold on to broken lights, because they’ll just add to the clutter next year when it’s time to install the lights again. Happy hanging!